Think about how may times throughout the day you feel agitated. From the moment you wake up til the moment you finally get to sleep. As the stresses of the day and worries of tomorrow whirl around in your stream of thought instead of finding it easy to rest as your body wants you too, you find yourself zoning out in front of a phone or the t.v. Distracting yourself from the noise of your mind. You wake up into the same anxieties and worries. It becomes an exhausting existence. You may be like I once was before I investigated a way to deal with stress, under the narrow minded presumption that meditation is for hippies, travellers or monks who remove themselves from the world in search of enlightenment. Surely anyone who isolates themselves from the stresses of daily life is going to enjoy peace of mind. unfortunately most of us do not have that choice. Life is in motion, we are in the thick of it and it shows no signs of slowing down. You may not like the idea of having to become a buddhist or join an Eastern religion in order to find a way to mentally cope with the daily barrage of over thinking driven by the pressures of an unavoidable routine of work or home life, especially if you are a parent. I mean who has the time for books and study when you spend every waking moment either chasing toddlers around and running a home, or are at work all day. Maybe you were brought up with Christian values and have no interest in riding two spiritual horses going in two different directions. It’s a hurdle many are faced with as the majority of meditation practices derive from the Eastern world. For many of us the idea of meditation sounds nice, yet completely unrealistic in the hectic lives we live. If you were to go online you find literally hundreds of exercises promoting mindfulness. Yet how affective are these practices of distraction? If you didn’t know I can tell you that most are more harmful than helpful. Let me explain. Distracting yourself from any problem, such as over thinking, anxiety, stress, depression or just taking a break from an overwhelmingly stressful routine. Is not solving anything. There maybe a momentary detachment from the problem as you visualise your self on an empty beach in the Bahamas – or hypnotizing yourself by focusing on your breathing but nothing really changes. You only feel you are improving but in reality you are only putting yourself further to sleep. Attaching yourself tighter to the underlying problem. If you are practicing this type of meditation and still short-tempered, or still filled with an anxiety problem you cannot shake, this is why. People reading this who have done anger management courses may still be questioning why the tools they were given are failing them. In order to solve any problem, firstly you need to see it – to become conscious of it. If asleep and lost in distractions (or unconscious) you will be unaware of the debris of negative energy you collect, from hour to hour, day-to-day. We really do become pressure cookers unless we can be freed from this constant build up of negative energy called resentment. Without it we would have no internal conflict. Life would become something very different for yourself and those around you, especially your children. So how do you become free of this force? And remain awake in a position to face the negativity in the stream of life day in day out without being affected, without becoming overwhelmed. It’s simple. We allow light in to remove it. Sounds bizarre I know, but not that bizzare if you are willing to consider that we a spiritual, as well as human beings, each with the ability to access the opposing force of resentment that exists in this universe. A force of light that can literally drive out the darkness we accumulate. And this life saving supernatural force of Grace can only be accessed through meditating without contemplating. Without distraction. If there was ever a case to meditate this way it would be this. That through becoming conscious yourself. You will one day be able to show your children how to also live without harbouring resentment. To live in a way that stress will become a tool to sharpen from instead of a problem that only destroys from the inside out. I can think of no greater gift to pass on to my daughters as a father. Here’s the link to the free meditation exercise. Firstly happy weekend to all of you, if it’s as sunny as it is here in the south of England at the moment I’m sure you too will be making the most of the spring sunshine. As Easter holiday’s approach, Frankie has finished school for the holiday’s and has been enjoying a break from the classroom and school work. It’s hard to believe this is her last year at primary school. With so much going on at home 24/7 I only really noticed lately how much our little girl has grown up. She has gotten in to her first choice of high school which a good few of her friends will also be attending and she is exited about the move to a bigger school. We’ll see how exited she is when all the homework starts coming in, but for now it’s great to see her so confident. She’s a world away from the shy little girl I first met six years ago. After a bumpy start to the year with my health and the knock on effects from me being unable able to work, we are now slowly getting back on track. I have been back at work for the last three weeks. Working in a different, less physically demanding role. It has been good to get back to a bit of normality. There have been the occasional day’s I haven’t been able to make it due to flare up’s of pain but for the most I am coping with it better now. My wife has had to deal with a lot over the last few months. It’s been difficult for both of us to understand and find acceptance around. I have found though, as with every other problem that arises in my life, the minute I begin to resent it, I get lost and consumed by that problem. And The problem with my central nervous system has been no different. I got angry with it. Angry that I had no control over it, fearful around work and how I would take care of my family, angry that I was unable to do daily tasks some days. The list goes on and on. Simply put I got infected with resentment and it made our whole situation more difficult. And since seeing it, and letting go of it – as if by magic I am coping better. My three month’s at home with the triplets awarded me some quality time though. I watched Blakely take her first steps to becoming a toddler. Now all three are into everything, all over the place and full of energy as they have discovered some freedom through becoming mobile. And they love music and dancing. This weekend we are heading away to Stacey’s parents again for the Easter holiday’s. A week away with family and a nice change of environment for the trio. Plus bags more room to run around in and at the moment they have tons of energy to burn off. They still haven’t developed in their speech. Yet they do mouth words along with songs. But they remain only in communication with each other and have some hilarious conversations. A morning board meeting, topics of discussion, chasing the dog. Trying to eat dogs biscuits without being caught. And hiding from mummy and daddy. So whatever you’re up to this weekend and over Easter have a great time. Enjoy the sunshine (if you have any) and make the most of what each day brings. Even if that day involves 20 nappy changes and endless bizarre conversations with cunning toddlers who are clearly upping their game. 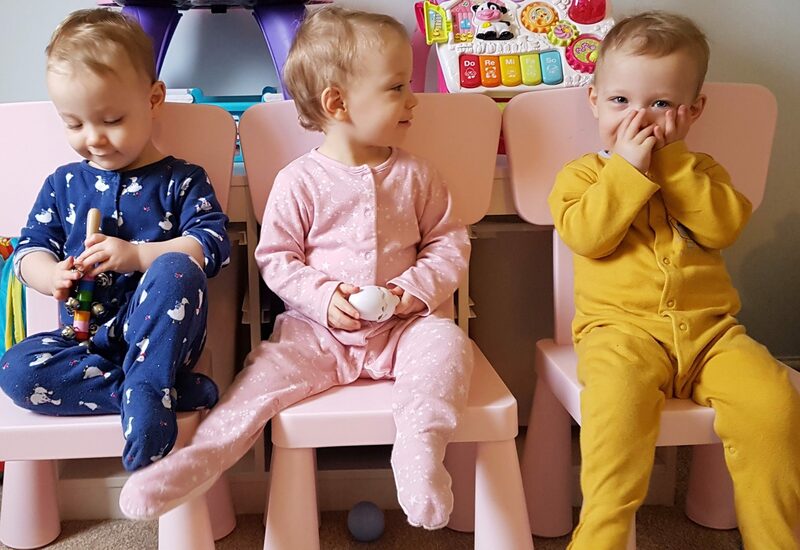 A couple of weeks ago I wrote a post about the difficulty of going out with the triplets without the constant attention. It got a big response which just highlights the problem of boundaries when it comes to babies. Following the hassle and attention they got at a mother and toddler group recently we now have three traumatized little one’s who panic the moment anyone comes near them. To the point now that they even get upset when a known face comes into the house. It’s a shame as we thought they had gotten over the attention when we are out. But they have taken a back step which has made it incredibly difficult for my wife to get out in the week with them. They don’t like stranger’s. Full stop. Imagine being a little baby still finding confidence in new environments and having strange faces getting up close and personal every 5 minutes. If they are not mum or dad they get scared. Imagine strange hands trying to pick you up when already upset by a barrage of strangers standing in front of you and staring. I’m a first time parent to babies, still I would never think to try and take a strangers baby out of it’s high chair because it was crying to try and pacify it. It wouldn’t cross my mind, yet people are offended when we ask them not to touch them or try and pick them up as it only upset’s them further. We have no problem pushing hands away that want to touch them. We have no idea of another’s personal hygiene, hands carry viruses and germs that we are left to deal with. And dealing with three sick babies are no joke. Yes they are remarkable, as they are cute but they are also little human beings with fears and needs of security. Especially when out in the world. We have had endless suggestions to just get them out into groups to socialize, and get on with it, but it has become a real challenge. Unless you are dealing with triplets day in and day out it’s difficult to be able to comprehend the attention and work involved. And to understand the effects and upsets that we later have to deal with from a disastrous trip to the shops. Toddler’s need boundaries and respect. They are finding their feet and need to feel comfortable in new situations and places were they can feel free to relax and take their surroundings in on their terms. You wouldn’t treat any other vulnerable human the same way. And if you do you need to consider the knock on effect of your actions. For now we are back at square one, with a lot of work to do to get them gaining trust again around anyone that isn’t us. From self destruction to parenthood – is emotional stability really possible? Not everybody is raised with the tools for parenting. Even those brimming with self-confidence at the idea of becoming a mum or dad can be smacked in the face once the harsh realities of the emotional strain and tiredness literally hit home. The pressures can be overwhelming to the most instinctive new parent. Some going into parenthood are raised in loving home’s, already aware of what contributes to a child’s wellbeing. But what about those who weren’t? Many become parent’s ill-equipped to deal with the pressures involved. Men and women already suffering from mental health problems and destructive obsessive behaviours from damaged upbringings entrusted with children, planned or not face the challenge of a lifetime in raising families who can’t escape the stressful environment they are born into. Without a new way to face the pressures involved, rather than escaping to damaging distractions, parents fail their children and the cycle goes on. Coming from a broken home myself I grew up full of resentment and anger towards the idea of a loving family life. It was a life I never imagined I would be able to cope with. I was too damaged to hold onto a healthy relationship and too self-centred to care about anyone other than myself. It was only when I got sober I began to understand the gravity and effect on my life from the absence of any fatherly direction and guidance in my life. The importance of two stable influences in the life of a child cannot be stressed enough. I also believe that any family can stay the distance, however damaged an individual beginning the journey of parenting may be. But it takes a willingness and dedication to change. Love needs to become a central force of the home. If I was to ever change the path for myself and those who would come to rely on me I had to let go of the grip of my past. The spirit of anger I harboured had to be replaced by one of patience and love. To become a loving parent I had to forgive, to give up anger. I could no longer carry the resentment and fear that culminated from years of frustration and bitterness at the damage of a past badly lived. It was that simple. If I didn’t let go it would drag into my family life and eventually destroy everything worthwhile. Even the most dishonest drug addict, the most self driven anger fuelled alcoholic has the ability to become the person a child vitally needs in a parent. All it takes is a willingness to let go of the past, outgrow fear and become conscious of the responsibility in front of them. The solution to any problem is to stop struggling with it. I had a world of fears going into fatherhood. Fears from abuse, fears of a past of chronic mental health problems and alcoholism that if I allowed to control me would have stopped me from being the husband and father I needed to be. By not struggling I’m referring to the internal daily battle we engage in with negative thinking and the emotions that weave their way into our lives through simply becoming lost in thoughts. If you have a head that doesn’t shut off and leave you alone. The answer to freedom from it is to separate from all thoughts as they arise to pull you from the present moment. To become an observer of that which passes through the mind. The good and bad without being affected by it. Do this and all internal problems, fears and anxieties lose their grip. It happens Instantly as we begin to live consciously in the present moment. Free from the attachment to the over thinking mind. In the present we find freedom from all mental health issues. Obsessive thinking and behaviours fall away, replaced by a natural intuition and discernment to deal with life without struggling. By living in this conscious state, brought about by a very special non-contemplative meditation we have everything we need to overcome fears and un-manageability. We find a new way to exist that can never fail to affect our children in a positive way. No matter how far we’ve fallen in the past, or how much we are fighting with presently. Life doesn’t need to be a struggle ever again. It became apparent to us as parents of triplets, from the first time we ventured out of the house with them that we were going to attract a lot of attention. And understandably. There are times I remember being out with them in the supermarket on my own and being surrounded in the isle, unable to move, blocked by cooing onlookers, whilst the babies cried and got upset with people staring at the them, and with all the hands reaching down to squeeze their cheeks, If I was a baby it would probably upset me too. It becomes difficult at times. Especially when the girls are tired, and we’re tired and we are just trying to get a shop done as fast as possible so we can get them back home to nap. There have been situations when we are feeding them in a cafe or restaurant and we have had strangers come over to our table and ask questions while we have mouths full of food and the babies are eating. Although the babies have got somewhat used to being stared at and approached by people they don’t know they can still get upset by it, especially when they are tired. And neither my wife and I have mastered having a conversation with a mouthful of sandwich, which can also make things awkward. The problem is that sometimes we have to explain to people that the babies can be upset by strangers getting in their faces and touching them. We have people look at us like were being rude and walk off at being asked by us to stop. It happens a lot. It can ruin a trip out for us when the attention doesn’t stop and were just trying to have a meal or take care of our children. Getting out is difficult enough, more-so alone with them which my wife has to when I’m at work, so the added stress of having to deal with trying not to offend strangers who want to pick up the babies from their high chairs to pacify them while my wife is feeding them can ruin her day. So maybe if you see a mum out with tired babies, and you want to get involved. Think about the mum who is dealing with a stressful situation, perhaps instead of walking over to ask her a handful of questions over the top of tired upset babies, ask her if she want’s a cup of tea. Ask her if there is anything she needs. We don’t like to have to ask people not to touch our babies, we don’t like to ask people not to try to pick them up while they are eating and get in their faces. And it’s not nice to be made to feel like we’re horrible people for asking this. It’s nice that they bring so much happiness to others, and we’re happy to answer questions but a bit of common sense, consideration and timing doesn’t go a miss. Have you had experience with this as a parent? If you follow my blog, you will be aware that behind the up’s and downs of parenting and life I have been writing a book. It’s in the final process of writing, but I would like to share a tiny bit of it with you. These paragraphs are taken from a chapter after the arrival of the triplets, In finding my own way around fatherhood. Having triplets is a journey of rolling with the punches. It is a constantly changing situation that you must adapt to or sink. For us it was mostly a case of figuring out the next best move as we went along helped only by Stacey’s motherly intuition. Our world became consumed with taking care of the babies. There was no life outside of that bubble in the beginning or for our foreseeable future. I started to understand how my Fathers resentment had set in when my brother was born, followed by myself. He had plans to be a famous musician, his heart set on bigger things until, bang! We turned up, both unplanned, and forced him into a life of struggling parenthood that he was ill-equipped for. We became a burden to him. The arrival of newborns is all-consuming. In all respects. There is little room for self-serving ventures or free time away from the duties at hand, especially in the early days. Every single move we now make revolves around the needs of the triplets. And I cannot afford to resent that. All my past relationships, bar none, failed because of the bitterness and frustration that life seemed to be constantly moving in the opposite direction of my expectations, and of what I felt I deserved (it makes me cringe to think of how I used to be). I also feared responsibility. Partly because I spent most of my time drunk, and partly because I was not great at dealing with life even when sober. My Dad was a young man with dreams to fulfil and problems from childhood bubbling under the surface, and overnight his dreams were squashed by the arrival of my brother. Then thirteen months later I came along and washed the last of them down the drain. And he could never let me, my Mum or my brother forget that because he was unable to forget and forgive himself. And I truly understand his state of mind looking back now. I don’t want to end up one of those writers that goes on about their illness all the time, It’s not what this blog is about. It is relevant how-ever to where I am at the moment in life so I promise to make this the last one. And there’s some nice pictures of the triplets if you don’t want to read about my wonky nervous system and what I now know. So after 3 months of being at home I will be back to work next week. Having now met with the pain clinic and had a clear diagnosis which has given me a better understanding of my condition. After a difficult six months It will be good to get back to a routine of work and home-life again. Although I’m still taking it in that my life is going to be different from now on. In the simplest terms I have a broken nervous system. And because of the haywire pain signals it is producing, and getting better at producing as it takes on a life of its own, I have been told I have to learn my limitations, in moving around and physical exercise. Not easy with triplet toddlers. I cannot push myself at all as I used to, it will only create flare up’s of immobilizing pain which can take days to overcome. I have been advised by the pain clinic to take baby steps in everything I do. Something I’m not used to doing one bit. I have tons of energy so it will be tricky to adjust. So my mission, if I choose to accept it, is to find a balance of movement and rest. The management is down to meditation and learning to observe the pain and the horrendous thinking that comes with a flare up of round the clock spinal electrocution and facial burning. While my wife and Frankie are having to do everything to manage the triplets while I wait for attacks to settle down. On the plus side though, it was explained to me that because I’m relatively fit, and the right weight for my hight and age that I have an advantage. Apparently people over weight who wind up with ‘Central nervous system hypersensitivity disorder’ go downhill very quickly. It’s going to take a while to get my head around the fact that this bizarre chronic pain is now permanent. An existing minor problem, originally caused within my years of active alcoholism, with only short attacks years and months apart that has now been most likely exacerbated to its current level of intensity since a car accident last summer. (a month after the accident I also got electrocuted pretty badly which probably didn’t help it). So I’m looking up (slowly) and ready to start getting on with this thing (even slower). At least I have a legend of a wife, and without Frankie helping out as much as she does this would be a whole lot harder. Having been home since Christmas, pain aside I have had the opportunity to spend everyday with the triplets. I have seen Blakely take her first steps, heard the girls clearly say ‘Mama’ for the first time and been able to see the important changes in the way they play together and interact. For identical triplets they are completely different in their personalities. Yet there are many traits they share. They are very conscious of each other. If one gets a juice bottle, they will get the others and take them to them first before drinking their own. Ava found a packet of biscotti biscuits, she got them open and shared them equally with her sisters. If one is upset the other two will comfort them by patting and stroking them. The traits they share seem to be more from a loving connection rather than anything else. They care for each other. For the most anyway. Being home isn’t ideal for many reasons, and some days are better than others. I have finally been diagnosed with a rare nerve pain disorder in which the pain varies from day-to-day. There is little relief when it flares up. Two days ago I managed to take the girls for a walk. Today I am struggling to move and cope with the pain. It frustrates me sometimes that I struggle with the triplets, to play with them and help Stacey out. The frustration doesn’t help the situation. I’ve never had physical limitations before so I’m still finding my way mentally around this new situation. The meditation is the only real saving grace in dealing with the daily stress of it all. working with the pain clinic will give me a better understanding. I meet with them next week. But as long as I’m here I am with the most important people in my life. And have ringside seat to the most entertaining show I’ve ever known, and will keep doing my best with home-life a day at a time. Children are front row observers of us as parents. What they see and feel from us is transferred to them and reflects in their own spirit and the behaviours they develop. If I was to live in a permanent state of emotional Instability, whether it be anger, agitation, impatience, anxiety or simply overreacting to stressful events in life, it is my children who will ultimately collect the spiritual debris of my failing to meet those pressures. And as I have recently discovered with my health, I cannot afford to let the inevitable problems that will arise from time to time take over my awareness of dealing with what’s in front of me and the responsibilities I have. When I left home I left a fragmented and stressful environment. My dad’s morphine addiction and drinking had reached dangerous proportions. I was 15 years old and it was inevitable that his over emotional nature would affect all of us as a family. Neither my mum, brother or myself left that home unscathed. My dad’s anger became mine. His spiritual dysfunction was transferred to me. I grew up hating him because he was angry and emotionally unavailable. I became as unbalanced and unhinged as he was, and I would never know freedom or recovery from mental health symptoms until I forgave him. Until I gave up anger. It’s important to me that I don’t make the same mistakes being a parent myself now. My children deserve the best beginning in life, and I see this with a clarity. I believe is my job as a dad. Not just to provide for them, but to be present and raise them in a spirit of love. With emotional consistency so that the stability I project will reflect In the confidence they deserve to develop while they find their way in their formative years. There are areas of my life I do my best to stay on top of. Especially since now having three more children to provide for. I had lots of fears arise during the pregnancy, the worry filled ‘what if……..’ Thoughts were constant as I prepared for our future with the triplets arriving. I had a lot to stay on top of mentally and physically for the health of all of us as a family. The responsibilities for me as dad are huge. Over the last six months there has been another massive change that I have had to get my head around, which has literally knocked me for six some days, and the fears and worries have overwhelmed me. Six years ago I felt electric shock pains across the top of my head and burning in the side of my face. It happened for a split moment. I didn’t give it much thought until it continued to happen, first the attacks came months apart. Sometimes lasting a few seconds sometimes minutes. I was offered medication but didn’t feel the crappy side effects I would have to put up with were worth the occasional burning shock to the head. Since then I have experienced it more frequently as the flare up’s of pain began in other areas of my body. Still I never chased it up and put the body pain down to the physical work I do. And I had no intention of taking medication. Last August the electric shocks and burning started one night and have yet to go. The random flare up’s across my back become excruciating to the point I can’t stand up and there are day’s I struggle to walk with the pain in my hips, and as I discovered quickly there is not a pain-killer on the planet that can alleviate the pain. There have been night’s I have been so overwhelmed with the pain in my head, I’ve been sat rocking on the stairs in tears while my wife deals with Frankie and the triplets. There have been MRI scans and blood tests to begin eliminating what the cause may be and it has been narrowed down to a rare nerve disorder. My central nervous system is misfiring in various parts of my body and sending pain signals back to my brain. And without much known about it there is no cure. Just a life of pain management. looking at all I have to support and provide for in my life, it has worried the hell out of me over the last six months. As well as the pain, day in and day out, I have been lost in fear and full of anger under the surface around my situation. Resentment has made the problem ten times harder to face. I am no good for anyone lost in my head. I have a boss who has been understanding of my situation and I will be returning to work in a few weeks after months at home. He has given me a new position as I am unable to work in the department I am trained to work in as it too physical for me to carry on working in, and there are days my head is too foggy to concentrate. On the plus side I no longer have the fear of losing my job, which had also been a weight on my mind since being absent from work. I have realised this week how much I have to be grateful for since this change has occurred to my health. It has scared me, angered me, frustrated and frightened me. All negative emotions that I cannot afford to live with if I am going to be present for my family. And as a good friend reminded me yesterday, the pain isn’t for a lifetime, I don’t need to be looking so far ahead. I only have to deal with it 24 hours at a time. Life can change overnight, as I’ve experienced many times in my life, there will always be challenges to face and this is no different. For now, without any real relief, it will be more a case of managing the emotional strain of being in constant pain while dealing with the job of parenting and knowing my limits of what I can and cannot do. I need to Stay out of fear, and stay out of resenting a situation I cannot control. If I can do that, I think It will be half the battle.